In general , STM32 contains a lot of GPIOs which you can use for your aplication. The power voltage is 3.3V, but some pins (GPIOs) are 5V tolerant. So it means, that the voltage of "Logic One" is 3.3V but you can connect device which has 5V "Logic One" and the STM32 will be still working. Which GPIOs are 5V tolerant you find in datasheet of your microcontroller. The Nucleo-64 development board contains two types of connectors - Arduino Uno Rev. 3 and Morpho connectors. Arduino connector contains only a few GPIOs, that good for small microcontroller. STM32 microcontroller have a lot of GPIOs so there is Morpho connector where are connected all GPIOs. The main document which you will need during your working is this. The document shows labels of Nucleo boards, what jumpers do, "how to program STM32 outside of Nucleo board". The main information is also pinout of Arduino and Morpho connectors and schematic of Nucleo board. As I mentioned above, STM32 contains a lot of GPIOs. The GPIOs are devidev to PORTs - A port, B, C, D and bigger microcontrollers have more PORTs. Each PORT has (typically) 8 pins (0 up to 7). The labeling of pins is e.g. PA0 - zero PIN of A PORT, PB5 - fifth PIN of A PORT. And so on. If you use Arduino library by STMicroelelectronics, the built-in LED is called the same like in other Arduino library - LED_BUILTIN. The LED is connected to PA5 PIN. How to install STM32duino library you find here. The each kind of example with STM32duino contains two types of example codes - using of LED_BUILTIN and using of external LED/Button. 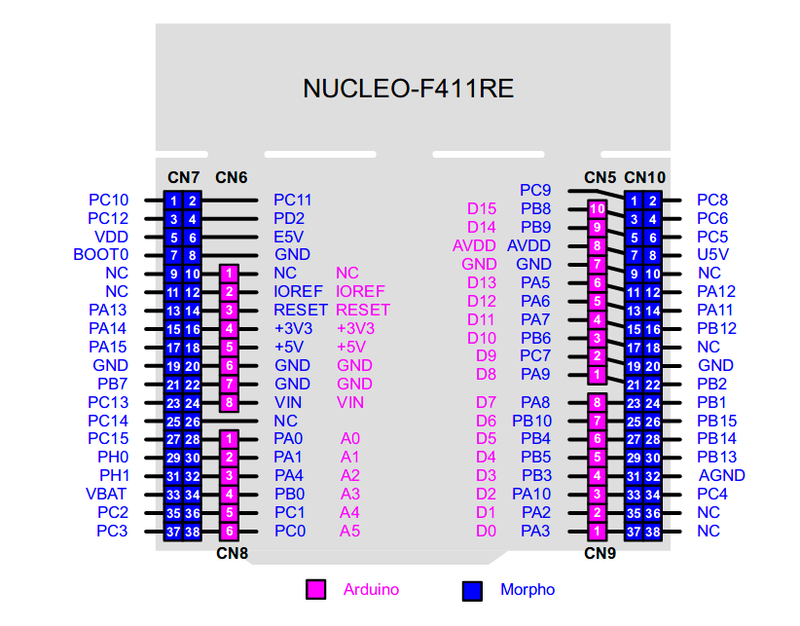 If you want to use different GPIO, check this document about STM32 Nucleo development boards. Connect the LED (with resistor) between GPIO PC10 and GND. The example code with description is here. Own LED on different PIN. // initialize digital pin PC10 as an output. Again, connect the LED between PC10 and GND. Connect the button between PC11 and GND (PC11 is next of PC10). If you press the button, the LED is blinking slower. You can use user button (blue cover) on Nucleo. The User button is connected to PC13. The LED_BUILTIN is connected to PA5 (or you can use the LED_BUILTIN name). Whole example you find here. // initialize digital pin PC11 as an input. Using of built-in LED and user button (blue cover). Connect the LED between PA0 and GND and the code will be change the light intensity of LED. The exampel code in here. Own LED - not built-in LED. // initialize digital pin PA0 as an output. Using of built-in LED. You can change the PA5 for LED_BUILTIN. And this is end of this article. If you like this article, please, share it and use strong>#STM32duino hastag.